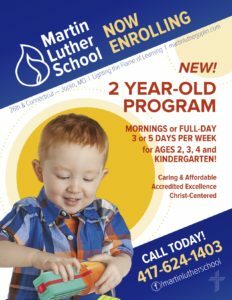 We invite you to be a part of what God is doing at Martin Luther School! This mission outreach of Immanuel Lutheran Church has been serving families in Joplin since 1953 with excellence in academics balanced with a Christ-centered approach. MLS has openings for students in preschool and kindergarten, and continuing through 8th grade. Hoping to meet the needs of even more families in our community, Martin Luther School will begin offering an all-new class for 2 year-olds in the Fall of 2019. When Immanuel moved from downtown Joplin to our current property at 26th and Connecticut, the first structure we built was…the school! 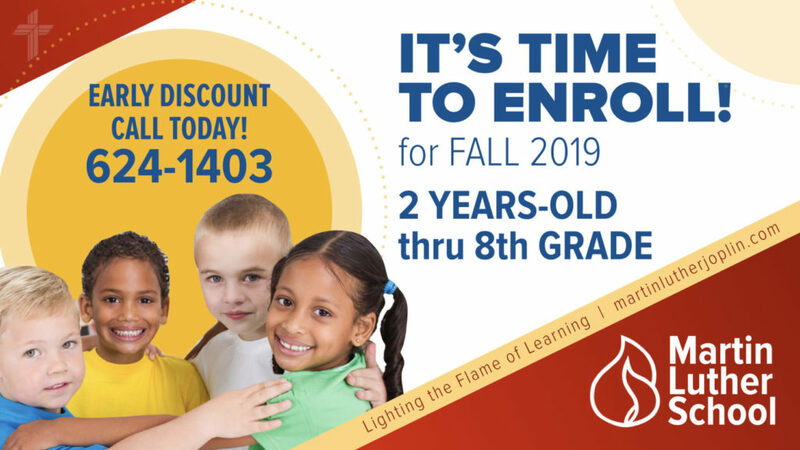 Martin Luther School is a part of Immanuel’s “DNA.” Come and see why we believe that our little Lutheran school might be just what your family needs. Schedule a free Educational Success Consultation and take a free tour with our principal, Mr. Jeremy Schamber. You can also visit Martin Luther School’s own website at martinlutherjoplin.com.